One of the first impressions you will make is how assertive you are, or whether you come across as aggressive, pushy or bossy. This judgement - in the eye of the beholder and based on their own agendas - will be made based on your communication style. I know it seems unfair but it's one of the realities women face in the business world. In our male counterparts it's viewed as an asset, while the line between assertiveness and aggressiveness gets blurred when people, especially men, view women. There's no point in trying to pretend this judgemental undercurrent won't be there while you are settling into your new position. 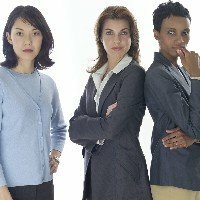 So it's far better to be prepared with the facts on assertiveness, aggression and passivity, be aware of your communication style and if there is a cultural bias toward assertive women. Assertive people simply state their opinions, while being respectful of others. Aggressive people attack or ignore others' opinions in favor of their own. Passive people don't seem to have opinions, or at least they don't state them. If company management had wanted a manager with either of the two latter communication styles, you wouldn't be in your new position. Aggressiveness or passivity would have come across clearly during your interview process. The following comparisons were developed by the Mountain States Center for Independent Living in West Virginia and spell out the difference in communication styles better than any psychology text I've ever read on the subject. As you look at the difference in styles, consider the impact of aggression and passivity on personal and business relationships. You will probably be able to identify all three communication styles among your co-workers - your peers, those further up the management ladder and members of your own team. The trick is for you to be assertive and not to take it personally when you have to deal with passives or aggressives. You're not a psychologist so don't try and "fix" whatever issues they have that cause them to communicate the way they do. As women we are predisposed to be nurturers so it's no surprise that we feel somewhat sorry for the passives and are embarrassed when an aggressive let's us have it in front of other people. Maintain your assertiveness! More than likely, everyone else has already noticed the aggressives and passives, so no one will think less of you for being assertive. In fact, their esteem for you will increase when you take the other two styles in stride. Incidentally, I tended more toward passivity when I first became a manager (looking back, probably because I was afraid of making a mistake), but learned to be assertive. There were people who noticed the change in my style and thought I was rocking the boat. But they were the aggressives so there would have been no way to please them no matter what I had done. It would have been far easier had I been assertive from the beginning.